You’re finished the gig and you’re enjoying a well-earned beer at the bar. You’re careful to keep an eye on your pride and joy, propped up against your amp on stage, to make sure nobody swipes it. It’s safe though, the drummer’s up there packing up his gear. Wait! The drummer’s knocked against your amp with his fat arse*. 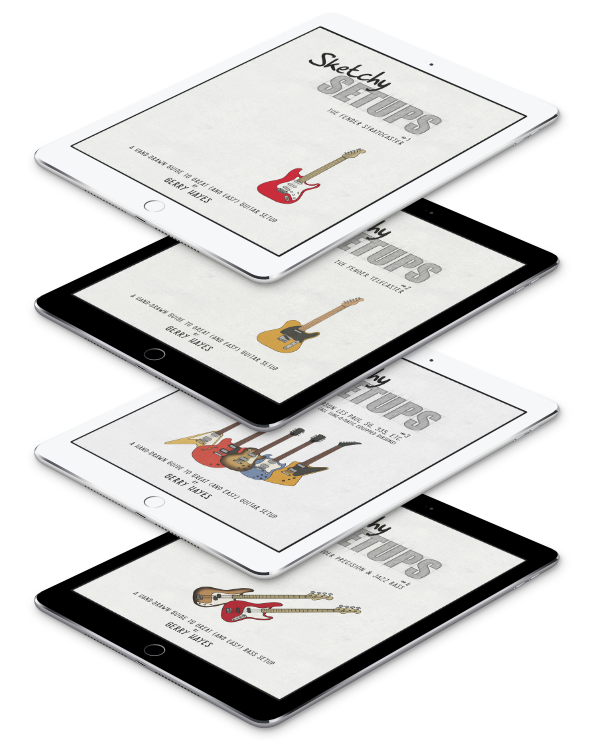 Your guitar tips, slowly, very slowly, it’s going, it’s going… And it’s gone. It hits the ground and the headstock keeps going. You can hear the crack over the noise of the crowd. Of course there is, but for a guitarist this is one of life’s grimmer moments. A broken neck. You fall to your knees, hands imploring the heavens, and bellow, “Noooooooooo!” The security guy eyes you suspiciously. Why? Why? For Clapton’s sake, why? How could this have happened? Well, you could possibly go so far as to call it a design flaw. On any guitar with an angled-back headstock, the area where it angles is naturally weak. This is because of a number of factors but primarily to do with the timber’s grain direction and the fact that the area is pretty thin – the thinnest part of the neck. Add to this the fact that many instruments have a truss-rod access channel here, effectively removing even more wood from an already weak area, and you have a recipe for breaks. The image on the left shows a Les Paul neck/headstock. I’ve added a dotted line to indicate, approximately, the depth that the truss-rod access cavity is cut. You can see there’s not a lot left. Many guitar makers try to alleviate the potential for trouble in this area with a variety of means; multi-ply ‘sandwich’ necks, truss rod-access moved elsewhere or reduced, scarfed headstocks, and the most common, a volute. A volute is simply a shaped/carved ‘bulge’ that’s left in the weak area to strengthen it (although it might be more accurate to say ‘not to weaken it’). Gibson are frequent stop-outs on this though. Although a volute was introduced on many Gibsons in the ’60s, it was phased out again and it’s appearance on modern Gibsons is hit-or-miss. Most don’t have one. Indeed, while all instruments with angled headstocks have breakage potential, Gibsons (SGs and Les Pauls in particular) top the charts in the headstock repairs I perform. If Gibson ever start strengthening this area, guitar repair guys all over the world are going to see their incomes drop. If you do manage to break or crack your guitar’s neck or peghead, don’t panic. Almost anything is repairable. Here are the immediate steps to take. If the headstock is still attached to the neck (the headstock veneer often keeps it attached), gently – very, very gently – slacken off the strings. Pop it in it’s case and get yourself to a good repair guy. If the headstock is just cracked, do the same – slacken off and get it repaired. Don’t try to fit the headstock back to the neck as the joint should usually be examined and cleared of any misaligned splinters or loose timber before this is attempted. Check for any splinters that have come loose and if you find any, pop them in a bag – they’ll help complete the jigsaw and assist in getting a good, clean repair. The first repair is the important one. If it’s not done well, then you’ve got a reasonable chance of the guitar breaking along that fault again. Sometimes string tension alone can be enough to pull a badly repaired break apart. And, repairing along a previous repair is much more difficult, time-consuming and often more invasive. Not to mention more expensive. The lesson? Don’t break your guitar neck but, if you do, get it repaired properly first time around. Talk to your repair guy and ask him/her to discuss the repair. A good repair guy will be happy to chat about their plans. What glue is used is important for example. For most repairs either hot hide glue or aliphatic resin is the right choice. If your repair-guy decides immediately to slap in a load of epoxy, probe them on why. While epoxy has a place in headstock repair, it’s generally a limited one. Its nature makes it difficult to penetrate cracks and it doesn’t grip wood in the same way as other glues – its rarely a first choice adhesive for these jobs. The majority of broken necks tend to be relatively straightforward. Some, however, require a bit more effort. 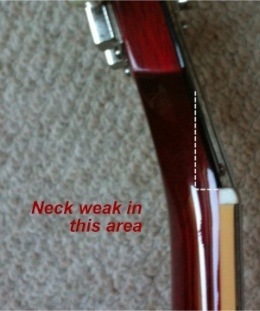 ‘Short’ breaks across the neck or the headstock that allow very little ‘glueing’ surface will often need to be reinforced. Reinforcement may involve glueing in new pieces of wood, called splines, that extend beyond the break and provide additional strength. Other reinforcement methods include the use of ‘overlays’. 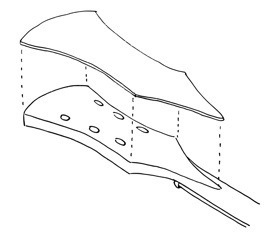 A back-strap or front-strap overlay is a veneer of wood that gets glued on to the back or front of the headstock and will often extend down into the neck area (as shown in the diagram). It’s necessary to remove existing wood from these areas to fit the overlay and the newly-glued overlays must be drilled for tuners and so on. Refinishing the area is also necessary. Overlays take a lot of work but can often be a relatively discrete way of reinforcing a break. This sort of reinforcement is often necessary for repairing previously-repaired breaks (i.e. second repairs) too- that’s why it’s important to get it right first time. Almost all headstock cracks and breaks are caused by the instrument falling. If everyone put their guitars into their cases after they were finished playing or gigging, I’d be able to afford less beer every month. Cases are not a guarantee – I’ve seen a headstock break after a fall in a case – but they certainly get you most of the way there. A good-fitting, hard case will protect your guitar from most things. If you wanted to be a bit anally-retentive about it, you could slacken the strings off before stowing your guitar but that’s probably overkill for most people (although you should definitely do so if you ever have to ship your guitar anywhere). If it’s too much of a pain to put your guitar away, get a decent stand or locking hanger. There are even hangers that can attach to your amp combo or cabinet now. Stands and hangers obviously won’t give you the same protection as a hard case but they’re better than just leaning your guitar against your amp (no matter how cool that might look). Protect your guitar and you might never have to get its neck repaired. If the worst happens though, don’t panic – things can be put right again. Make sure you trust whoever is repairing the broken neck though – the only thing worse than having to get your neck repaired is having to get it done twice. If you’ve any questions, feel free to shout up in the comments below. I’ll do my best to answer them.